Welcome to the April Mediterranean Achievers Blog Hop. This month our theme BABY LOVE is close to my heart, as I have a lovely new baby grand daughter. There is nothing better than grandma cuddles! I'm sure you will enjoy some baby love inspiration from each of the Stampin' Up!® demonstrators from around the world who are taking part in this blog hop. I chose to use the "Made with Love" stamp set and combined some background stamps from Gorgeous Grunge. Blushing Bride, Rose Red, Pear Pizzazz and Crumb Cake classic inks are used for all stamping and water colouring. I used to dabble in quilting and like to find inspiration from many different crafts, so today I have made some little patchwork squares and filled them with stamped images and little animals. I fussy cut the animals so they would fit inside the squares. The little patchwork squares are created using the 1 3/8" circle punch and the 1" square punch. Simply place the cut out square inside the circle and fold the edges inward. The paper I used is English Garden Designer Series Paper. I coloured the baby animals using an Aqua Painter - I love water colouring! I hope you enjoy this card and will follow along to the next person on the list below. what a coooooool idea Ann! Clever!! And the English Garden paper works perfectly for baby! ooooohhh I just love this Ann......so cute and dimensional.....it reminds me of a quilt design.....just gorgeous! Your card is so cool! I love the quilting idea. And those cute animals are just perfect! love the look. Great way to create the feeling of a sweet baby blanket. WOW - I absolutely love the "circle squares" what a neat idea! I'm loving this technique! Very cool Ann. Great card. Oh my - what a beauty Ann! 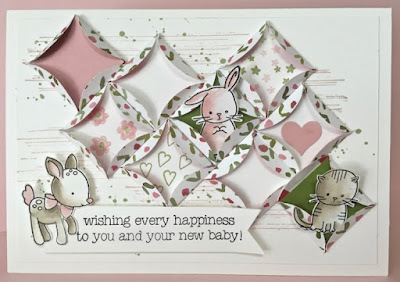 The quilt inspiration works so well on this card! I love the colours and the fussy cut animals too!